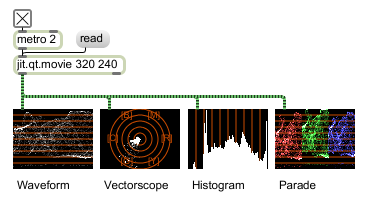 The jit.scope object is the video Swiss Army Knife cousin of the MSP scope~ object - it presents a number of modes for visually inspecting the values of a matrix and displaying them as waveform, vectorscope, histogram or parade visual data. bang Outputs the current matrix. Displays the input matrix by scaling to the window size. (mouse) Clicking with the mouse will display a horizontal or vertical line trace and numerical cursor. def. :25 Sets the amount of data, per pixel, to accumulate for display. def. :0.35 When the jit.scope object is set to parade mode, this attribute sets the desaturation for the display (expressed as a float in the range 0. 1.0). def.:0. Window border flag (default = 1) When the flag is set, the window is displayed with a border. dstrect int Specifies the portion of the output matrix written to by the input frame (default = 0 0 (matrix width) (matrix height)) The proportions of the rectangle are expressed in the form left top right bottom . All values are relative to the top left corner of the object's viewing area. def. :0.8 0.3 0. 1. Sets the Graph Color in RGBA format. rgb: displays an overlaid set of histograms for R, G, and B values. def. :0.8 0.8 0. 1. Sets the Graph Color displayed on hover in RGBA format. def. :0.2 0.2 0.2 1. Sets the Popup Highlight Background Color in RGBA format. def.:1. 1. 1. 1. Sets the Popup Highlight Text Color in RGBA format. def. :0 Interpolation flag (default = 0) When the flag is set, the incoming matrix is interpolated when scaling to display. def.:0. 0. 0. 1. Sets the Popup Background Color in RGBA format. def. :0.9 0.9 0.9 1. Sets the Popup Text Color in RGBA format. srcrect int Specifies Specifies the portion of the input matrix used when copying an input matrix to the internal matrix. (default = 0 0 (matrix width) (matrix height)) The proportions of the rectangle are expressed in the form left top right bottom . All values are relative to the top left corner of the viewing area of the input matrix.